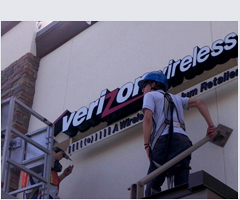 In order to install a new sign, you will need to know what the sign criteria is. If you lease your propery, contact the owner to find out what is allowed for the sign size, type, color, etc. In addition to a landlords sign criteria, there are rules set by your local municipality. Your municipality can tell you what those sign rules are if you bring them a site plan of the property and a legal description with the parcel I.D. An occupational licence will tell what jurisdiction you are under. Obtaining this information will streamline the proccess, allowing you to have your sign installed as quickly as possible and providing this information along with a description of the sign will get you an accurate quote for your sign. ISL will then travel to your location to take photos and supply a rendering of your store with the new sign on it, along with options and quotes for each option. Once an option is accepted, the permit process can begin. To complete the permit process for your new sign, ISL will need the following documentation signed and the originals returned to our office. Site plan - needs to show building location on lot and major road junctions accessing the property. If your location is part of a plaza, please note on plan which unit is yours. Letter of Authorization made out to International Signs and Lighting Inc. This document needs to be signed by the landlord or property owner, and it also needs to be notarized. Notice of commencement - depending on the job value we require this document to be recorded. International Signs will advise you on this requirement.